The answer to that question is no. 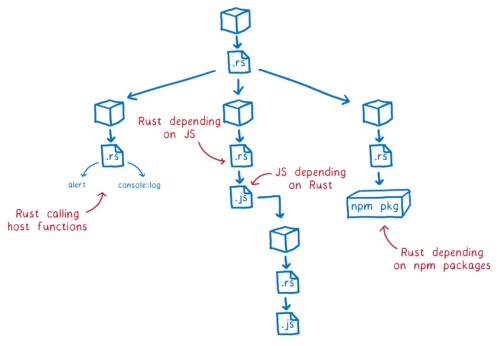 We don’t expect Rust WebAssembly apps to be written completely in Rust. In fact, we expect the bulk of application code will still be JS, even in most Rust WebAssembly applications. But sometimes for specific parts of an application, Rust+WebAssembly is the right tool for the job… like when you’re parsing source maps, or figuring out what changes to make to the DOM, like Ember. But WebAssembly isn’t there yet. 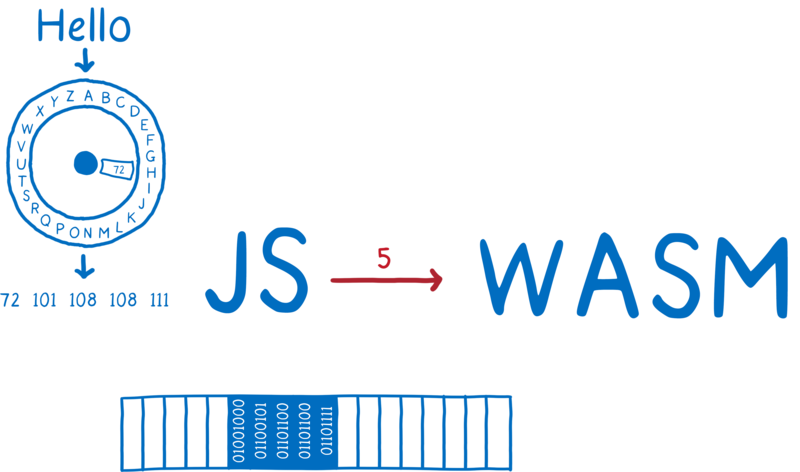 To make this happen, we need to build tools to make WebAssembly easier to load, and easier to interact with from JS. 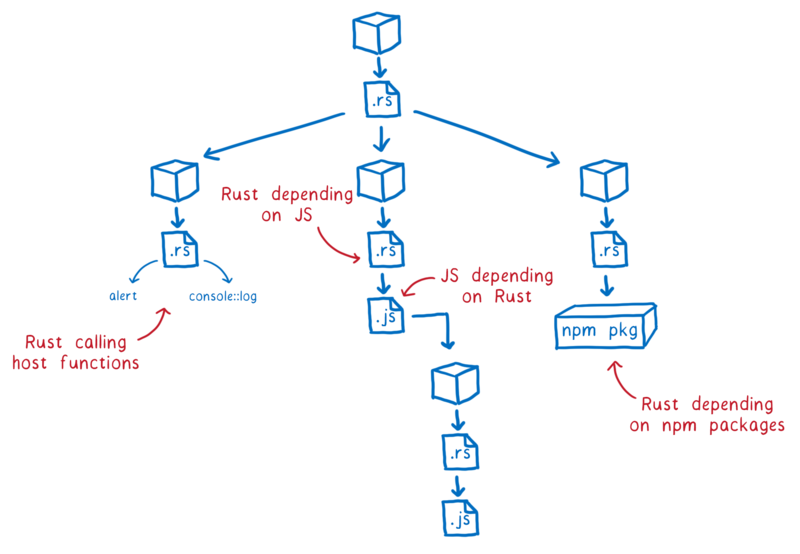 This work will help Rust. But it will also help all other languages that target WebAssembly. How do you make it easy to pass objects between WebAssembly and JS? 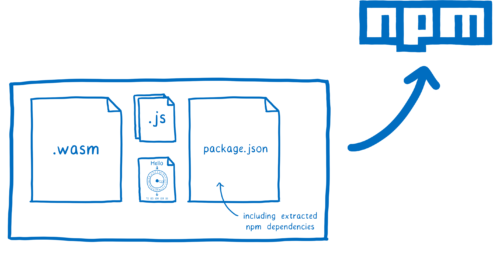 How do you package it all up for npm? How do developers easily combine JS and WASM packages, whether in bundlers or browsers? But first, what are we making possible in Rust? So that’s what we are making possible in Rust. Now let’s look at the WebAssembly usability challenges that we need to tackle. Q. How do you make it easy to pass objects between WebAssembly and JS? One of the hardest parts of working with WebAssembly is getting different kinds of values into and out of functions. That’s because WebAssembly currently only has two types: integers and floating point numbers. And that’s only what’s required for strings. If you have more complex types, then you’re going to have a more convoluted process to get the data back and forth. If you’re using a lot of WebAssembly code, you’ll probably abstract this kind of glue code out into a library. Wouldn’t it be nice if you didn’t have to write all that glue code, though? If you could just pass complex values across the language boundary and have them magically work? That’s what wasm-bindgen does. If you add a few annotations to your Rust code, it will automatically create the code that’s needed (on both sides) to make more complex types work. … Or many other niceties. 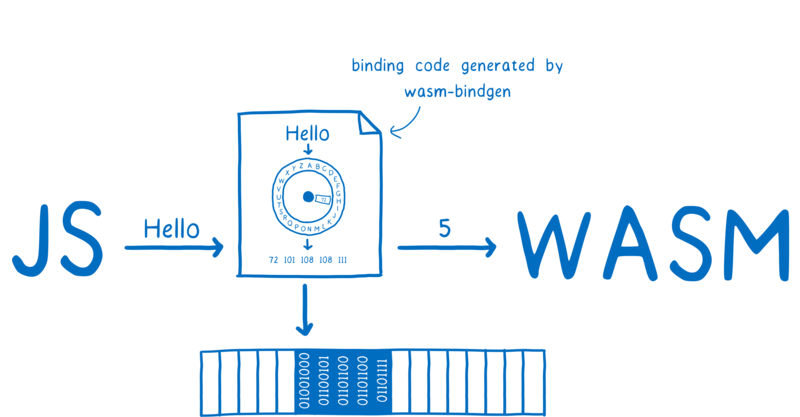 Under the hood, wasm-bindgen is designed to be language-independent. This means that as the tool stabilizes it should be possible to expand support for constructs in other languages, like C/C++. Alex Crichton will be writing more about wasm-bindgen in a couple of weeks, so watch for that post. Q. How do you package it all up for npm? Again, it would be nice if this could be done for us. And that’s what wasm-pack does. 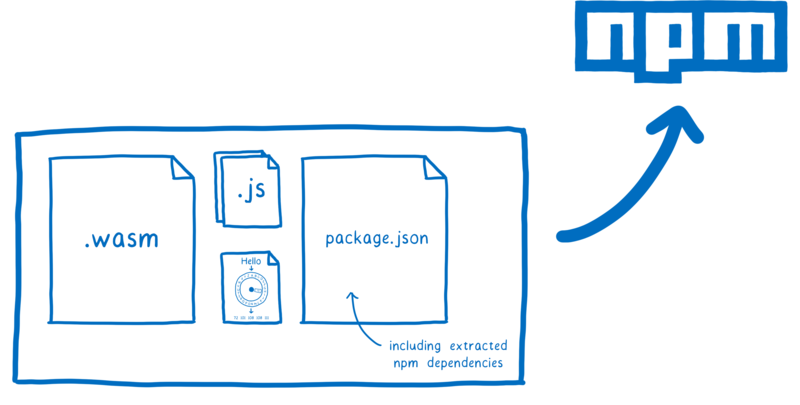 It is a one-stop shop for going from a compiled WebAsssembly file to an npm package. It will run wasm-bindgen for you. Then, it will take all of the files and package them up. It will pop a package.json on top, filling in all of the npm dependencies from your Rust code. Then, all you need to do is npm publish. Again, the foundations of this tool are language-independent, so we expect it to support multiple language ecosystems. Ashley Williams will be writing more about wasm-pack next month, so that’s another post to watch for. Q. How do developers easily combine JS and WASM, whether in bundlers, browsers, or Node? 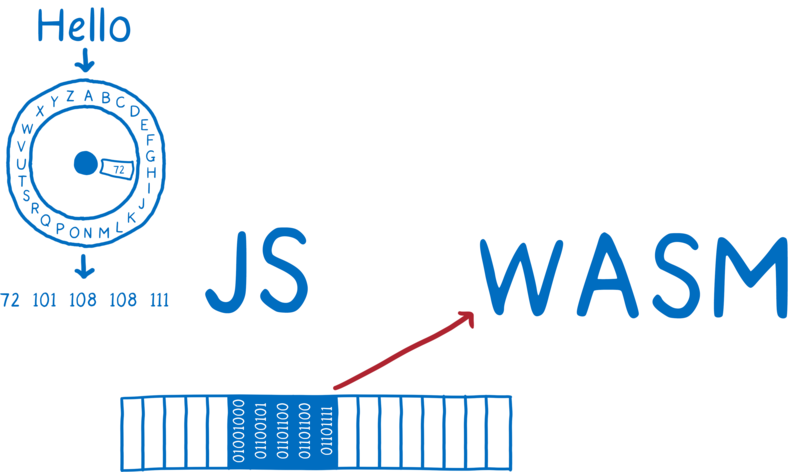 Now that we’ve published our WebAssembly to npm, how do we make it easy to use that WebAssembly in a JS application? 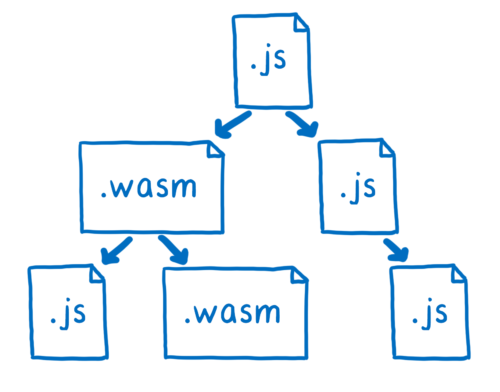 Make it easy to add the WebAssembly package as a dependency… to include it in JS module dependency graphs. Currently, WebAssembly has an imperative JS API for creating modules. You have to write code to do every step, from fetching the file to preparing the dependencies. It’s hard work. But now that native module support is in browsers, we can add a declarative API. Specifically, we can use the ES module API. With this, working with WebAssembly modules should be as easy as importing them. We’re working with TC39 and the WebAssembly community group to standardize this. But we don’t just need to standardize ES module support. Even once browsers and Node support ES modules, developers will still likely use bundlers. That’s because bundlers reduce the number of requests that you have to make for module files, which means it takes less time to download your code. 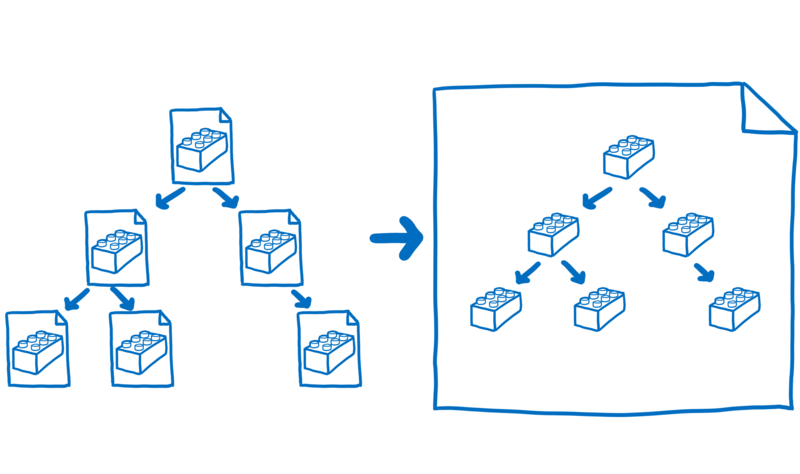 Bundlers do this by combining a bunch of modules from different files into a single file, and then adding a little bit of a runtime to the top to load them. Bundlers will still need to use the JS API to create the modules, at least in the short term. But users will be authoring with ES module syntax. Those users will expect their modules to act as if they were ES modules. We’ll need to add some features to WebAssembly to make it easier for bundlers to emulate ES modules. 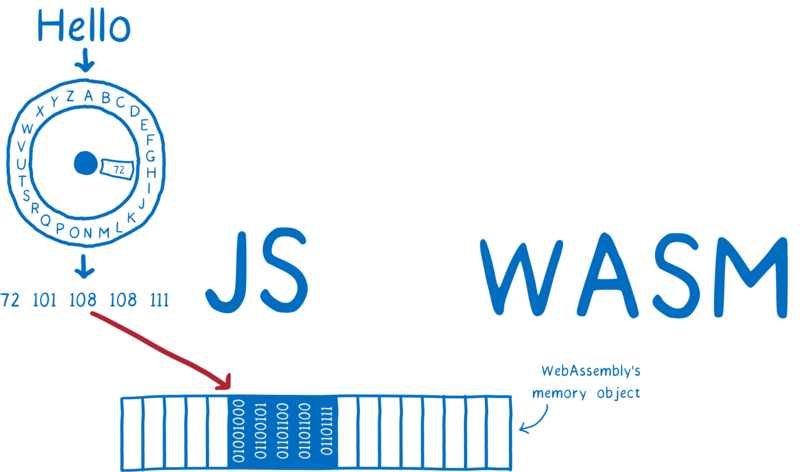 I will be writing more about the effort to add ES module integration to the WebAssembly spec. I’ll also be diving into bundlers and their support for WebAssembly over the coming months. I like your sketches. I also like what you wrote, obviously. It’s good to know that another language will be supported by browsers. Just a question, it will support multi threading from it’s core. As a long time C++ programmer I like that web assembly improvements are targeting multiple languages so that a larger community can participate. Thanks for this article. It’s very helpful for me. really great and appreciate you. Will bundlers really make any sense in the bright world of dominating HTTP/2 with multiplexing and pipelining? Awesome article, Lin! Thanks for sharing the information about wasm-bindgen and wasm-pack; it definitely looks like those will lower the barrier to entry for using Rust in WASM apps. Have you gotten a chance to play around with the out-of-the-box Rust/WASM support in the Parcel bundler yet? Here’s their post about the update that added support: https://medium.com/@devongovett/parcel-v1-5-0-released-source-maps-webassembly-rust-and-more-3a6385e43b95. Indeed :) We’ve talked with folks from both webpack and parcel about wasm-bindgen, and it should be useful to all of the bundlers.